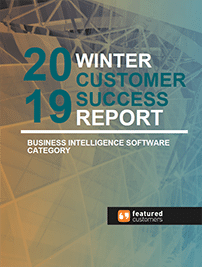 Entrinsik Informer has been named a “Top Performer” for business intelligence tools in the 2019 Winter Customer Success Report published by FeaturedCustomers.com. FeaturedCustomers evaluated all the potential Business Intelligence Software companies on its platform for possible inclusion in the report. Only 34 companies meet the criteria needed for being included in the Winter 2019 Business Intelligence Software Customer Success Report. Entrinsik Informer received an overall score of 93 earning a Top Performer award in the category. The Customer Success Report is based on the curation of authenticated case studies, testimonials, and reviews from across the web, telling a complete story of vendors in the Business Intelligence Software space through real customer experiences. Scores are determined by multiple factors including number of total reviews, customer success content, social media presence, and vendor momentum based on web traffic and search trends. The Top Performer designation is awarded to vendors with significant market presence and enough customer success content to validate their vision. Highly rated by customers, Entrinsik Informer consistently publishes high quality vendor produced customer success content and curate’s quality customer reviews from multiple third-party sites. “This marks the 2nd year FeaturedCustomers’ Customer Success Report has focused on business intelligence tools and the 2nd year Entrinsik has been recognized for Informer’s market-leading business intelligence solution and dedication to delivering the highest-level in customer support,” says Doug Leupen, President and CEO at Entrinsik. Entrinsik Informer 5 is a robust, extensible data discovery and analytics platform that simplifies the process of accessing, cleansing, blending, and analyzing on-prem and cloud data. Based on a single web-based platform, Informer 5 makes it easy for organizations to aggregate disparate data to create a cohesive, curated, governed data hub for self-service data analysis. Because of its open-source API-based architecture, Informer easily integrates with various CRM, ERP and enterprise systems within various industries including Higher Education, Insurance, Manufacturing & Distribution, Healthcare, Public Safety, Not-for-Profit, Government, and many others.